Worried about accessing your money after you've put it away but before you're ready to retire? Here is one way to circumvent that and put your mind at ease. Occasionally I’ll run into someone just getting started saving that is worried about putting so much money in retirement accounts because they have a vague sense that at some point they might need access to the money in the future. They couldn’t tell you specifically what they’ll need the funds for (perhaps a mortgage, emergency, future living expenses, etc.) but feel more “comfortable” keeping the money in a regular taxable brokerage account rather than what they perceive as locking up the money forever until they’re 59.5. Besides missing out on all the tax arbitrage benefits of retirement accounts, the fear of locking your money away might not be as big as you think. We’ve already run the math to show that the 10% penalty in your 401(k) account isn’t even that bad if you decide to simply pay it. But if you’re willing to do some life planning, there are a couple of other easy ways to get access to your money before you hit 59.5. We’re going to explore one today: The Roth IRA Conversion Ladder. 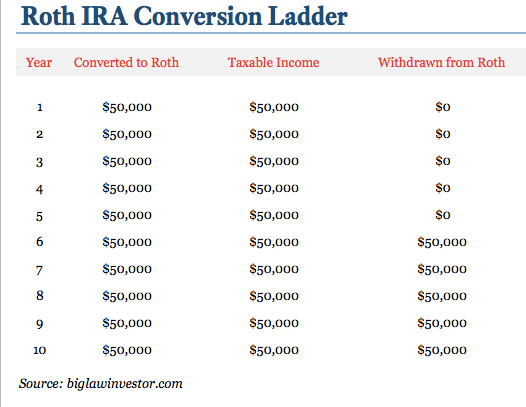 The basics of the Roth IRA Conversion Ladder are pretty simple: (1) you roll pre-tax 401(k) money to a pre-tax Traditional IRA; (2) you convert pre-tax Traditional IRA money to post-tax Roth IRA. You can then withdraw the contributed amount from a Roth IRA tax and penalty free. The Roth IRA Conversion Ladder comes with two catches. The first is that you need to wait five years after conversion before you can withdraw the money without penalty. The second catch is that you must pay income taxes when you convert money from a pre-tax Traditional IRA to a post-tax Roth IRA. You have to build a ladder. Let’s imagine a lawyer that decides to call it quits at the age of 45 and wants to access 401(k) funds before 59.5 without paying the 10% penalty. Let’s further imagine that this lawyer wants about $50,000 in annual going forward. In the first five years you’d be building the rungs of the ladder as you convert money from a pre-tax IRA account (formerly your 401(k)) to a post-tax Roth IRA. The conversion would generate $50,000 in taxable income each year. Paying income taxes puts you in the same position as you would be if you were withdrawing 401(k) money after age 59.5. Because of the 5-year conversion rule you wouldn’t be able to withdraw this money immediately, otherwise you’d defeat the purpose of the 10% penalty entirely. The IRS isn’t clueless as to what you’re doing! However, the IRS thinks making you wait 5 years is enough time to keep you from taking advantage of this path around the 10%. And while that might discourage some, all it really takes is a little advanced planning. However, you probably noticed that for years 1 through 5 you have a problem. You can’t withdraw the $50,000 while you are waiting for the money to season thanks to the 5-year conversion rule. To solve this problem, you have two options. The first possible solution is to begin the Roth IRA conversion five years in advance of when you’ll need the funds. The problems with this, however, is that you’ll end up adding $50,000 to your income during years when you’re working, thus subjecting that $50,000 to a high marginal tax rate. Also, you might find it logistically difficult to get the money from a 401(k) to a Traditional IRA so that you can perform the conversion. For those two reasons, this may not be the way to go. The second solution is to withdraw the money from some other source. Again, a little planning goes a long way. The money needed for the first 5 years could come from (i) previous Roth IRA contributions (not the backdoor kind, but direct contributions, since direct contributions can always be withdrawn without tax or penalty; (ii) withdrawals from a 457 account; (iii) savings in a regular taxable brokerage account or (iv) income from a side hustle. Savings in a regular taxable brokerage (or savings) account seems the most likely to me. If you saved up $250,000 in a taxable account, you could withdraw $50,000 per year for five years before your Roth IRA Conversion Ladder kicks in. The process sounds more complicated than it is but conversions are pretty easy (Vanguard has one button to press which gets it done in about 5 minutes). After that, all it takes is a little bit of planning for you to access these funds well before you’ve hit the age of 59.5. Let’s talk about it. Does knowing that there are ways to access retirement funds pre-retirement make it easier to contribute and max out retirement accounts? This is a good portion of our game plan for early retirement. Once I quit the 9-5 in a few years, I’ll start conversion process and let the waiting game begin. In the meantime, those first five years will likely be a little tight, but doable. We’re building up our taxable accounts and real estate rentals to ensure we have enough income to get by. After those first five years though, we’re going to actually be in great shape to have some more fun in our early retirement! Love the simplicity of this, on the one hand, but one the other: Don’t forget (dear readers, because I know Joshua knows this) to account for inflation in those conversion years! You may find that you want to convert a higher amount than simply $50,000 all the way up that ladder, as the upper rungs may need to grow over time to match expected inflation. Otherwise, your spending power is nearly guaranteed to decline as you climb the ladder. The more you depend on this “inaccessible” savings to fund your lifestyle, the more you should worry about that! Another reason I’m grateful to have married someone with access to a 457 – makes planning far easier! 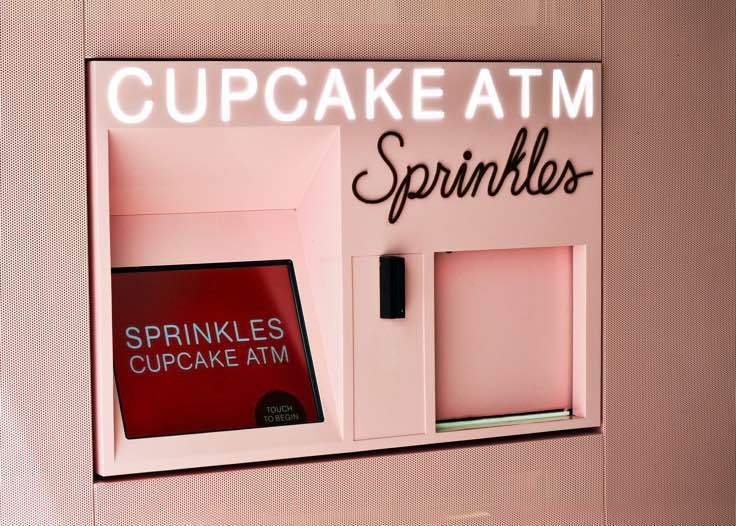 It’s a pretty slick way to make your money accessible and future withdrawals, even if you don’t need the money to live on. Though I’m several years away, I was planning on doing this once I retire. The plan was to live off of capital gains from a taxable account and use the tax room to convert to Roth IRA at the lower tax bracket. Thanks for the clear explanation. I’ve been wondering about this for some time. Thanks for the great summary. If I’m reading it right, if income is low enough, one could convert without paying taxes at all in marginal tax rate in kept at the lowest level. Yes, that’s right. Only thing to keep in mind is that when you do a conversion, the converted amount does count as income so as you fill up your personal exemption and standard deduction, eventually you’ll get to the point where you’ve run out of tax-free space and you’ll start to pay income tax on the converted amount. That’s why a little bit of planning can go a long way.